In other words, no all-blue uniforms for Boise State and no more all-green uniforms for schools like Oregon, Baylor (see above), and South Florida. The Mountain West conference originally banned Boise State this past season from wearing all-blue on their home field’s blue turf. However, the conference lifted the ban following the season. One problem with this rule is that it might actually increase the number of non-green playing surfaces in college football. Teams with all-green uniforms can get around the ban by just changing the colour of the field. South Florida plays on grass. 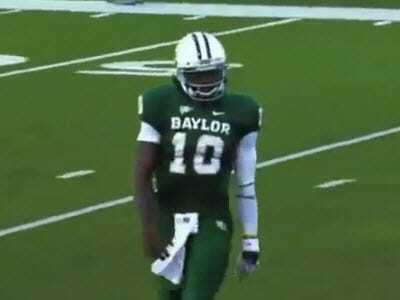 But might we see Baylor playing on gold turf or Oregon on a yellow field in the near future?